On Saturday 16th March, between 10am and 4pm, why not come and join in the fun…The Kookey Chefs will be there too…. Bring your little ones along to decorate a cupcake to take home, and be part of the REloved window display! The lovely local Southwell Cakery (famous for their fabulous occasion cakes) are kindly providing the cupcakes, and there will be lots of decorations to let imaginations run wild! 1. Preheat the oven to 190C (170C fan oven), gas mark 5. Line a 12-hole muffin tin with paper muffin cases. 2. Whisk the butter and sugar in a bowl with an electric hand whisk or beat with a wooden spoon until pale and creamy. Gradually whisk in the eggs until just combined. Then add the flour, lemon zest, baking powder and milk. Whisk with an electric hand whisk until combined and fluffy. 3. Divide equally between the paper cases, filling them about two thirds full in each case and bake in the oven for 18-20 minutes until golden and risen. Leave to cool in the tin for 5 minutes, then transfer to a wire rack to go cold. Then decorate as you wish! 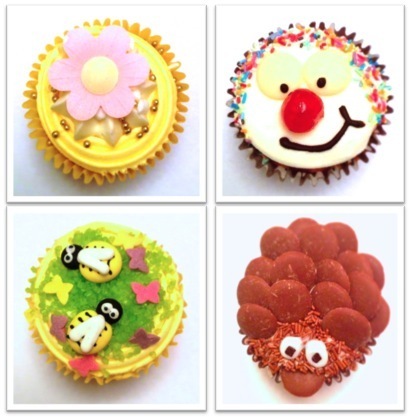 So we have been busy creating cupcakes in the kitchen…here are a few designs that we came up with…remember you can decorate you cakes with anything you fancy from sprinkles, to sweets to cake toppers!